Love is in the air! For those with furry family members, we have some fun “love paw” designs for you this month. This set of designs was created by Lisa Shaw for Embrilliance using StitchArtist. Using library shapes and the Subtract feature of StitchArtist L3, you can see how quickly and easily you can create your own unique design object. This video from our Embrilliance Youtube channel shows the steps on how this is done. Once you have the object, applying different stitch types such as applique, motifs, and fills is easy. 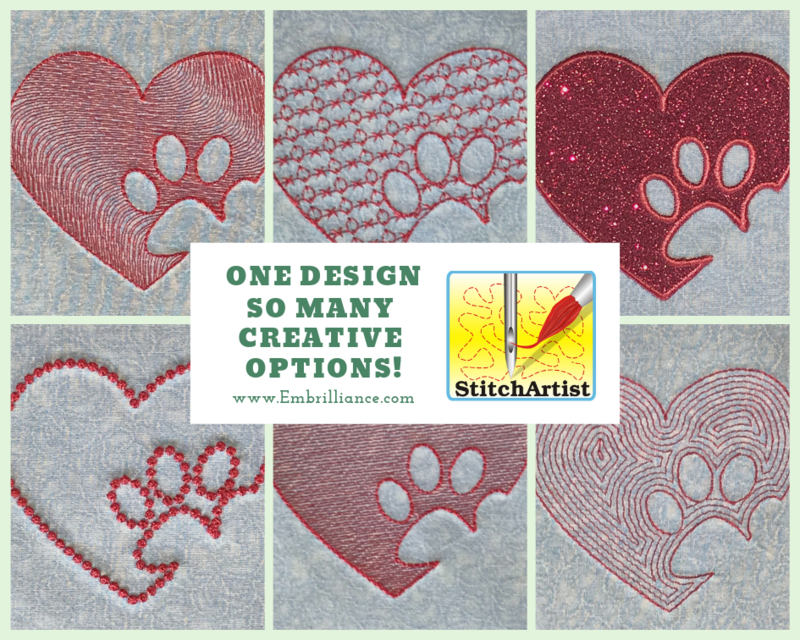 So many different options to go with all of your embroidery embellishment projects. Here is a zipped file that contains 9 different versions of this design! The designs are provided in our native .BE format, enabling you to save a stitch file for any embroidery machine. If you aren’t already an Embrilliance owner, we provide a free method to use our software called Express Mode that will not only allow you to use any of the wonderful free designs found in our project blog, but also enables you to install and create basic text treatments with fonts distributed in our popular .BX format produced by many embroidery design creators. To learn more about Embrilliance Express and for the instructions and links you need to download, install, and use our software with our free project files, please click here. We’d love to see how you use our designs; if you’d like to be featured on the Embrilliance project blog, click here to submit your pics! Posted 2 months, 1 week ago at 12:14 pm. "I"ve enjoyed my Embrilliance Essentials."